From last year, there has been excitement of an Asian boom in everyday necessities like food, miscellaneous goods, travel, and more. With a "season" theme, items incorporating an Asian taste are much in fashion. Slowly swaying and swimming goldfish are very refreshing to look at. In the water, the thoroughly indigo blue is refreshing. ゆらゆら泳ぐ金魚はとっても涼しげ。水の中はどこまでも藍色でさわやかです。 The two small birds are always close friends. The golden embroidery brings about the Asian-ish style. An Asian daughter and a close rabbit friend are always together. The floating lotus at the water's surface is indeed Asiatic. アジアな娘は仲良しうさぎといつも一緒。水面に浮かぶ蓮の花は、いかにもアジアチックです。 A panda and an elephant are in the midst of an ethnic travel home. How did this two animal trip happen?! This character is super random but cute... 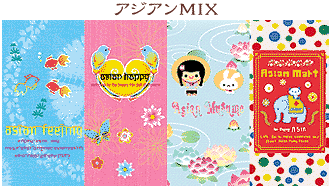 I'm pretty sure that the third one with the girl and rabbit says "Asian Musume." "Musume" means "daughter" in Japanese.